National legislation in force in Swaziland (eSwatini) allows use of firearms and even intentional lethal use of force by law enforcement officials against unarmed suspects or prisoners in violation of international law. According to the 2005 Constitution of the Kingdom of Swaziland,S. 14(1), 2005 Constitution of the Kingdom of Swaziland Act.the fundamental human rights and freedoms of the individual are guaranteed, including respect for life; the freedom of peaceful assembly and association and of movement; and the protection from inhuman or degrading treatment or arbitrary search and entry. In 2018, the King of Swaziland renamed the country the Kingdom of eSwatini. Section 15 of the 2005 Constitution protects the right to life. It is stipulated thatS. 15(4), 2005 Constitution of the Kingdom of Swaziland Act. (d) in order to prevent the commission by that person of a serious criminal offence. Under Section 18(2) of the Constitution, a person "shall not be subjected to torture or to inhuman or degrading treatment or punishment". Chapter V of the Constitution addresses law enforcement, stating that law enforcement officials shall act in accordance with the “high degree of responsibility required by their profession” and that they should “respect and protect human dignity and maintain and uphold the human rights of all persons.” Law enforcement officials are prohibited from torturing or inflicting “inhuman or degrading treatment or punishment,” and may not “invoke superior orders or exceptional circumstances as a justification" for torture or other forms of degrading punishment.S. 57(1-4), 2005 Constitution of the Kingdom of Swaziland Act.Nevertheless, the Constitution maintains the King's power to declare a state of emergency, which may involve the revocation of certain rights. The rights to life, to equality before the law, to security of the person, and to freedom from torture and ill treatment are non-derogable.S. 38, 2005 Constitution of the Kingdom of Swaziland Act. A range of legislation governs use of force by law enforcement officials in Swaziland. The 1957 Police Act entrusts the Royal Swaziland Police Service with the prevention of crime and the bringing of offenders to justice.S. 7(3), 1957 Police Act.Some of the legislation dates back to the 1930s. The 1938 Criminal Procedure and Evidence Act allows a police officer immunity from prosecution for shooting to death an escaping criminal, whether or not he or she is armed or otherwise poses an immediate threat to life.S. 41, 1938 Criminal Procedure and Evidence Act. shall not be greater than is necessary to secure the dispersal of the gathering and shall be proportionate to the circumstances of the case and the object to be attained.S. 11(10), 2017 Public Order Act. The 1953 Game Act (as amended in1991), gives Game Rangers (the Conservation Police) immunity from prosecution for killing any person they suspect of having engaged in poaching.1953 Game Act 51/1953 (as amended through 1991).In 2017, Swaziland told the Human Rights Committe they were considering "to review" the Game Act. Under Section 11 of the 1964 Prisons Act, a prison officer is entitled to use lethal force against a prisoner to prevent his escape. (2) A prison officer may use such force against a prisoner as is reasonably necessary in order to make him obey a lawful order which he refuses to obey, or to maintain discipline in a prison. (d) endangering the life of, or is likely to inflict grave injury to, such prison officer or to any other prison officer or person. (4) A prison officer who in the exercise of his powers under this section wounds or kills a prisoner shall not thereby incur any criminal or civil liability. S. 11, 1964 Prisons Act (Amended L.33/1966). There is no dedicated, independent police oversight body in Swaziland. Under the Constitution, a national Commission on Human Rights and Public Administration is given the mandate to investigate complaints of constitutional rights violations, injustice, corruption, abuse of power and unfair treatment by public officials.S. 164(1), 2005 Constitution. 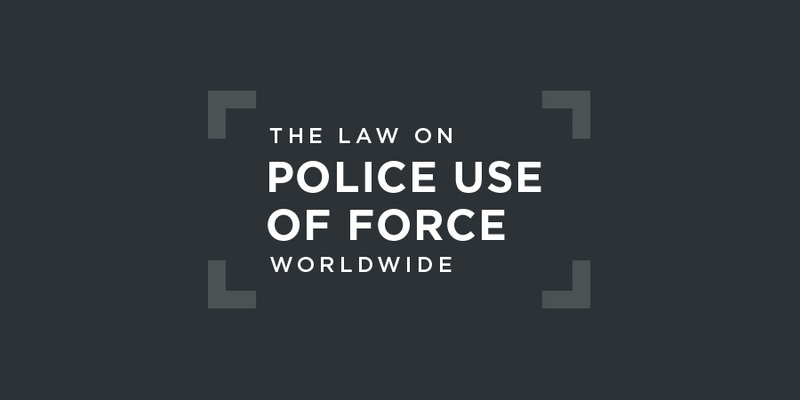 the permissive conditions in Article 41 of the Criminal Procedure and Evidence Act and at provisions in the Public Order Act which leave it to the discretion of the individual police officer to decide whether it is expedient to use force. The Committee was also concerned at "reports that proposed amendments to the Game Act may give game rangers immunity from prosecution for using force against persons suspected of poaching. "Human Rights Committee, Concluding Observations on Swaziland (in the absence of a report), UN doc. CCPR/C/SWZ/CO/1, 23 August 2017, §30. amend its national legislation governing the use of force by police officers and game rangers to ensure effective protection of the right to life in line with Article 6 of the Covenant.Human Rights Committee, Concluding Observations on Swaziland (in the absence of a report), UN doc. CCPR/C/SWZ/CO/1, 23 August 2017, §31. take measures to ensure that the law and the practice are in accordance with the Basic Principles on the Use of Force and Firearms by Law Enforcement Officials.Human Rights Committee, Concluding Observations on Swaziland (in the absence of a report), UN doc. CCPR/C/SWZ/CO/1, 23 August 2017, §31. Swaziland has not ratified the Protocol to the African Charter on Human and Peoples' Rights, allowing the African Court to hear cases alleging a violation of the Charter by the state. This case concerned allegations of arbitary arrest, inhumane conditions during detention, and torture by police officers "who, taking him to an unlit room at night, beat him up and stomped on his feet while attempting to extract information on the whereabouts of a missing car key". While giving judgment for the plaintiff as to the unlawfulness of his arrest and his conditions of detention, the Court rejected the allegations of torture. He did not supply any corroborative evidence such as the evidence of a witness who saw him during or after the beatings, bruises on his person, or a medical certificate issued to him after his release. Although I grant that the length of time it took for this case to come to trial made it unlikely for bruises/scars to be exhibited, I still find that a medical certificate issued after the plaintiffs release from the police cells or the evidence of one who saw his state after the fact, would have served as corroborative evidence. Although corroboration is not always essential to the proof of an allegation, in this circumstance, it was. This was because the evidence of Mdziniso, arrested around the same time and for the same offence (indeed the plaintiff alleged that they were taken to the Mbabane Police Station together and interrogated in that dark room around the same time), could have supplied the needed corroboration of torture and beatings but did not.